For those of you who have never experienced the joys of Port you owe it to yourself to part with more than a few bucks for a bottle of Vintage Port. 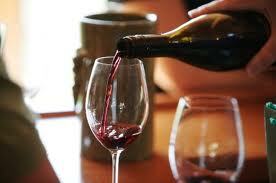 There are several different types of Port wine, Ruby, Tawny, Late Bottled and some others. Vintage port is in a league of its own. Here is a little bit of what it’s all about. Port wine comes from the Douro region in the north of Portugal. Port retains its unique sweetness in contrast to other wines because the fermentation process that greatly reduces the sugar content of the grapes is halted halfway through by the addition of a special grape brandy that is added to the mix. The addition of the brandy raises the alcohol level of the wine to nearly 20%. In very good years, those characterized by mild winters and hot summers, a vintage year is declared. This happens, on average, about 3 times a decade. Vintage port spends two years in a cask and is then bottled. It has the ability to age for many years. The declared vintages for this first decade of the 21st century are the 2000, 2003 and 2007. Two Vintage ports from 1994 were rated 100 points by Wine Spectator magazine and the prices, if you can find a bottle of either, skyrocketed from the mid $50.00 mark to several hundred dollars per bottle. Vintage port should be allowed to stand upright for a while before opening to allow the “crust” or sediment to float to the bottom. Once opened, Vintage port should be decanted and allowed to “breathe” for 2 to 3 hours before serving. They should also be consumed within 24 to 48 hours after opening as oxidation begins to take place almost immediately. 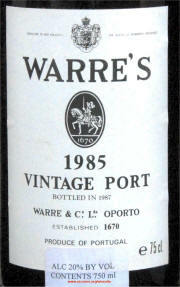 Vintage ports are not wines to serve with food. They go well with a Stilton Cheese or other cheeses from the “bleu” family. Some prefer chocolates with port. It is definitely a dessert type wine. Many connoisseurs enjoy a cigar or pipe with a glass of Vintage port. It may not be for everyone but Vintage Port is something totally unique in the world of wine and certainly worthy of a try. You may become a fan!